There is a pull out banner inside of the pen barrel, when people pull it out, they can see your marketing and prmotional message, the banner is retractable and fun. We are pen manufacturer located in China, offer ball point pens with scroll out custom message, scroll pens with retractable pull out banner, custom imprinted message scroll pens, advertising retractable banner pens, promotional flag pens, this innovative retractable banner pen leaves a long lasting impression. If you would like to buy banner pens with your custom logo printed, welcome contact us for more details. Large print area, 4 color process on double-sides imprinted available. Barrel with custom logo is available. The banner is over 4 times larger than a business card and can be printed on both sides in full colour with any artwork required. 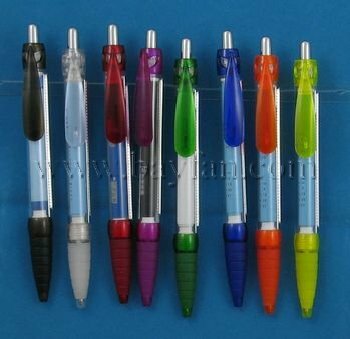 We are banner pen supplier & manufacturers in China, wholesale all kind of pens, welcome to buy pens from China direct. if you would like printing on the pen barrel or clip, please contact us for more detail. Banner pens contain a spring loaded, laminated banner which self-retracts inside the barrel of the pen. 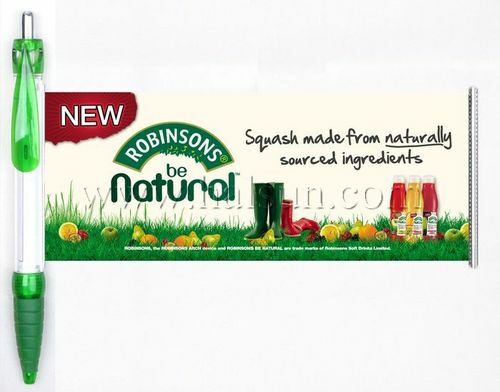 you can print your own full color logo, contact information, message, advertising on both sides of the pullout banner. below is an artwork for your reference. We can offer plastic ball point pens with your logo and message on it, shipping to worldwide by air express (DHL/UPS/EMS/FEDEX) , to door service. please offer your shipping address to estimate shipping cost. Welcome to contact us for price quote, sample or other request. Customized Pull out advertising pen with roll out flags. Pull Out Banner Message Pens. Free shipping to USA, West Euro, Australia. HSBANNER-9 is one of the best selling Pull out advertising pen and with unique water drip clip and soft rubber grip. The Pull out advertising pen with roll out flags HSBANNER-9 include a retractable paper flag with film coated to ensure durability. Your full colored advertisement picture can be printed on both sides of retractable flag size up to 180*68MM, which will impress all your target customers with your products or service. Pull out advertising pen are a great way to create a lasting impression. With an eye-catching retractable banner housed inside a stylish pen, your message is sure to be kept handy and visible at all times. create excellent advertisement for any promotion idea. 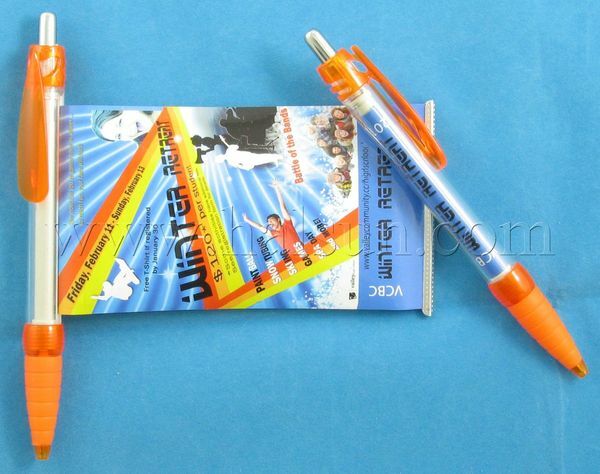 We’ve been professional Chinese manufacturer and direct seller of Pull out advertising pens for years. We’ve helped many companies to enhance their promotional program, distinguishing political candidates by giving away this unique and useful Pull out advertising pens to public. Supplement your banner stand displays with the perfect trade show promotional giveaway. Message pens! Display your message inside a Pull out advertising pen! Why Pull out advertising pen? Scroll Banner Pens / Pull out advertising pen are a novel idea that will make your next promotion unique, effective & fun. The simple scrolling design of the banner pen has an instant attraction to all who comes in conact with them. Add your choice of plastic pen colours and you’ve got a perfect match to your corprate look & style. 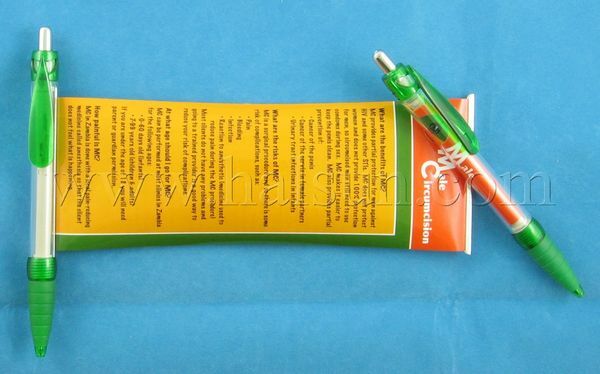 Scroll Banner Pens are also known as info pens, banner pens, scroll pens, Pull out advertising pen, billboard pens, and are most often refered to as pull out pens. Customized novelty pens with springloaded banners. Pull Out Banner Message Pens. Free shipping to USA, West Euro, Australia. HSBANNER-9 is one of the best selling novelty pens with springloaded banners and with unique water drip clip and soft rubber grip. The novelty pens with springloaded banners HSBANNER-9 include a retractable paper flag with film coated to ensure durability. Your full colored advertisement picture can be printed on both sides of retractable flag size up to 180*68MM, which will impress all your target customers with your products or service. novelty pens with springloaded banners are a great way to create a lasting impression. With an eye-catching retractable banner housed inside a stylish pen, your message is sure to be kept handy and visible at all times. create excellent advertisement for any promotion idea. We’ve been professional Chinese manufacturer and direct seller of Novelty pens with springloaded bannerss for years. We’ve helped many companies to enhance their promotional program, distinguishing political candidates by giving away this unique and useful Novelty pens with springloaded bannerss to public. Supplement your banner stand displays with the perfect trade show promotional giveaway. Message pens! Display your message inside a Novelty pens with springloaded banners! Why novelty pens with springloaded banners? Scroll Banner Pens / novelty pens with springloaded banners are a novel idea that will make your next promotion unique, effective & fun. The simple scrolling design of the banner pen has an instant attraction to all who comes in conact with them. Add your choice of plastic pen colours and you’ve got a perfect match to your corprate look & style. Scroll Banner Pens are also known as info pens, banner pens, scroll pens, novelty pens with springloaded banners, billboard pens, and are most often refered to as pull out pens. We’ve been professional Chinese manufacturer and direct seller of Retractable banner penss for years. We’ve helped many companies to enhance their promotional program, distinguishing political candidates by giving away this unique and useful Retractable banner penss to public. Supplement your banner stand displays with the perfect trade show promotional giveaway. Message pens! Scroll Banner Pens / Retractable banner pens are a novel idea that will make your next promotion unique, effective & fun. The simple scrolling design of the banner pen has an instant attraction to all who comes in conact with them. Add your choice of plastic pen colours and you’ve got a perfect match to your corprate look & style. Customized Custom scroll pens with roll out flags. Pull Out Banner Message Pens. Free shipping to USA, West Euro, Australia. HSBANNER-9 is one of the best selling Custom scroll pens and with unique water drip clip and soft rubber grip. The Custom scroll pens with roll out flags HSBANNER-9 include a retractable paper flag with film coated to ensure durability. Your full colored advertisement picture can be printed on both sides of retractable flag size up to 180*68MM, which will impress all your target customers with your products or service. Custom scroll pens are a great way to create a lasting impression. With an eye-catching retractable banner housed inside a stylish pen, your message is sure to be kept handy and visible at all times. create excellent advertisement for any promotion idea. We’ve been professional Chinese manufacturer and direct seller of Custom scroll pens for years. We’ve helped many companies to enhance their promotional program, distinguishing political candidates by giving away this unique and useful Custom scroll penss to public. Supplement your banner stand displays with the perfect trade show promotional giveaway. Message pens! Display your message inside a Custom scroll pens! Scroll Banner Pens / Custom scroll pens are a novel idea that will make your next promotion unique, effective & fun. The simple scrolling design of the banner pen has an instant attraction to all who comes in conact with them. Add your choice of plastic pen colours and you’ve got a perfect match to your corprate look & style. Scroll Banner Pens are also known as info pens, banner pens, scroll pens, Custom scroll pens, billboard pens, and are most often refered to as pull out pens. 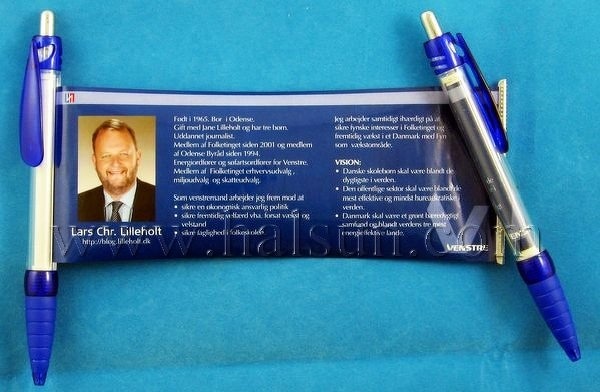 Customized novelty Poster pen with roll out flags. Pull Out Banner Message Pens. Free shipping to USA, West Euro, Australia. HSBANNER-9 is one of the best selling novelty Poster pen and with unique water drip clip and soft rubber grip. 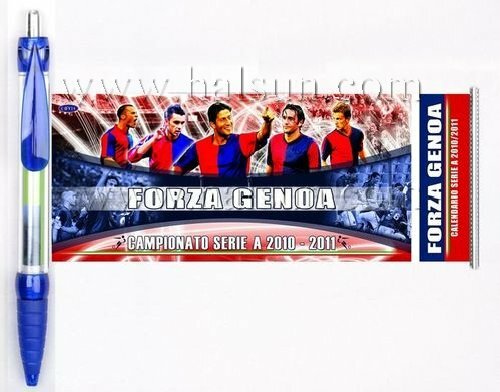 The novelty Poster pen with roll out flags HSBANNER-9 include a retractable paper flag with film coated to ensure durability. Your full colored advertisement picture can be printed on both sides of retractable flag size up to 180*68MM, which will impress all your target customers with your products or service. novelty Poster pen are a great way to create a lasting impression. With an eye-catching retractable banner housed inside a stylish pen, your message is sure to be kept handy and visible at all times. create excellent advertisement for any promotion idea. We’ve been professional Chinese manufacturer and direct seller of Novelty Poster pens for years. We’ve helped many companies to enhance their promotional program, distinguishing political candidates by giving away this unique and useful Novelty Poster pens to public. Supplement your banner stand displays with the perfect trade show promotional giveaway. Message pens! Display your message inside a Novelty Poster pen! Scroll Banner Pens / novelty Poster pen are a novel idea that will make your next promotion unique, effective & fun. The simple scrolling design of the banner pen has an instant attraction to all who comes in conact with them. Add your choice of plastic pen colours and you’ve got a perfect match to your corprate look & style. Scroll Banner Pens are also known as info pens, banner pens, scroll pens, novelty Poster pen, billboard pens, and are most often refered to as pull out pens. Flag Pen,Custom Flag pen,Marketing novelty Pen with pull out calendar,novelty Pen with pull out calendar for company gifts. 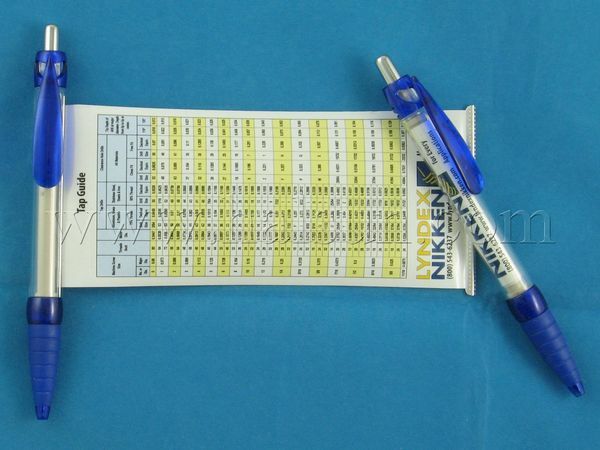 Customized novelty Pen with pull out calendar with roll out flags. Pull Out Banner Message Pens. Free shipping to USA, West Euro, Australia. HSBANNER-9 is one of the best selling novelty Pen with pull out calendar and with unique water drip clip and soft rubber grip. The novelty Pen with pull out calendar with roll out flags HSBANNER-9 include a retractable paper flag with film coated to ensure durability. Your full colored advertisement picture can be printed on both sides of retractable flag size up to 180*68MM, which will impress all your target customers with your products or service. novelty Pen with pull out calendar are a great way to create a lasting impression. With an eye-catching retractable banner housed inside a stylish pen, your message is sure to be kept handy and visible at all times. create excellent advertisement for any promotion idea. 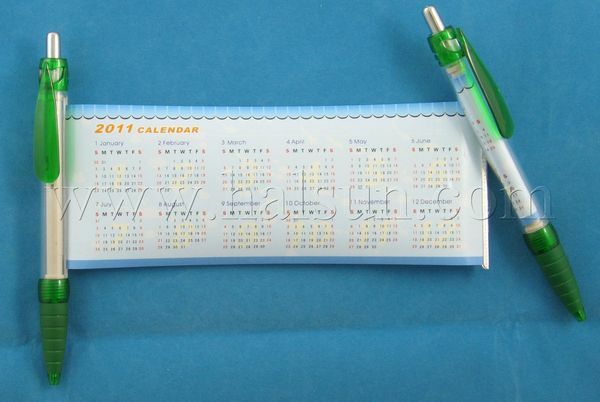 We’ve been professional Chinese manufacturer and direct seller of Novelty Pen with pull out calendars for years. We’ve helped many companies to enhance their promotional program, distinguishing political candidates by giving away this unique and useful Novelty Pen with pull out calendars to public. Supplement your banner stand displays with the perfect trade show promotional giveaway. Message pens! Display your message inside a Novelty Pen with pull out calendar! Why novelty Pen with pull out calendar? Scroll Banner Pens / novelty Pen with pull out calendar are a novel idea that will make your next promotion unique, effective & fun. The simple scrolling design of the banner pen has an instant attraction to all who comes in conact with them. Add your choice of plastic pen colours and you’ve got a perfect match to your corprate look & style. Scroll Banner Pens are also known as info pens, banner pens, scroll pens, novelty Pen with pull out calendar, billboard pens, and are most often refered to as pull out pens. Pen Paper Pulls out Logo, is the ultimate promotional pen. Originally patented almost 30 years ago and still leading the industry for the best price versus performance ratio. Pen Paper Pulls out Logo is 100% customisable and will not only deliver a tonne of information with impact and WOW FACTOR, it will also be a promotional item or a gift that people will love to show off. Artwork for your own made to order Pen Paper Pulls out Logo can be easily prepared by any graphic designer. Proofs are usually emailed for an approval (PDF File). A proof can be assembled into a pen on request – fees apply. Production time from artwork signoff is around 20 to 25 days. Normally 4 weeks to your door. The genuine product is built to last and is a refillable product. Refill inserts are available at most stationers. 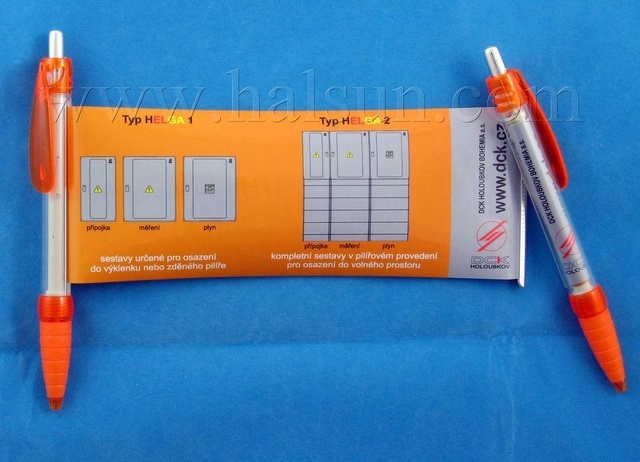 Display your message inside a Pen Paper Pulls out Logos! The graphic printed Banner Pen is a unique promotional giveaway that is both informative and practical. Our pens are used for many different reasons, some large corporate companies use them as a promotional gift, some use them to take to tradeshows, conferences and other events, we also have a number of charities that purchase the banner pen for a number of uses, they can also be used instead of business cards or brochures to keep your company name and details at the tip of their finger tips.